The first step in addressing a problem is to admit there is a one. OK I admit, I like to collect Masonic bling. Perhaps it’s more than just a small collection. I’ve got countless numbers of lapel pins, medals, rings, watches, watch fobs and buttons. Additionally, I’ve collected a ballot box, a complete set of working tools, officers’ jewels, aprons and even a set of Masonic pillars. Then there are the Shrine fezzes, Grotto fezzes and Scottish Rite caps. Not to mention the Knight Templar sword, KT Chapeau and White Shrine of Jerusalem altar apron. In my plastic boxes, I have coins, tie clips and numerous sets of cufflinks. Why so much bling? I enjoy meeting the people that have given me the pins. Buying an old Masonic ring knowing that has worn sides because a devoted brother wore it before, gives me the perspective that our fraternity has been around for centuries. The Masonic pillars, which were in an Indiana lodge and a part of countless brothers’ degrees. 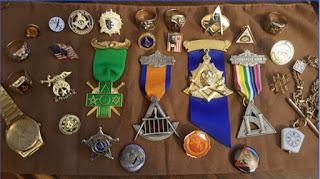 The medals I have acquired after being at a Scottish Rite Reunion or participating in an AMD degree and thinking of the hard work and dedication it took to portray the degree work. In the picture with this article is a watch given to me by fellow Midnight Freemason Todd Creason, a Midnight Freemason button that was created by Robert Johnson, a lapel pin from Naval Lodge No. 4 in Washington DC that was given to me on my first visit and I later joined as a member and the 2017 Grand Masters pin from Virginia from a brother whom I met for the first time on a recent visit to Arlington National Cemetery. The items themselves are obviously just things and most don’t have much monetary value. But what they represent is priceless. A brotherhood that has transcended hundreds of years and an on-going commitment by individual men seeking to improve themselves through Freemasonry. Hey you're not alone. I have the collector's fever too. My largest cache of items are Grand Master's pins. A couple of commemorative lodge coins which I like too. Yes, you're absolutely right when you say it's not because of any intrinsic value. The items are worthy of keepsake because of the Brother who gave them to me.